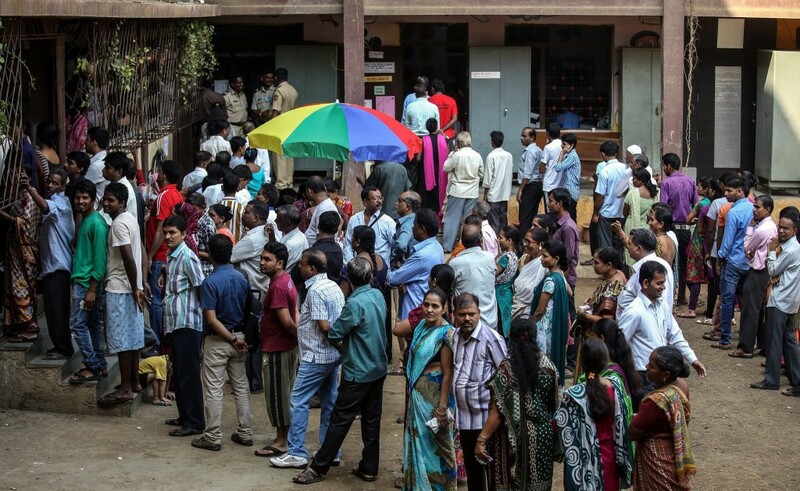 Many Muslim voters of Maharashtra State supported a new sectarian political force in October. MUMBAI, India — When he set out on a muggy morning in mid-October to vote in the Maharashtra State legislative elections, Zubair Azmi intended to cast his ballot, as usual, for the Indian National Congress, the party that has promised for years to protect Muslims like him. But as he walked the streets of Byculla, a once-affluent South Mumbai neighborhood fallen on tougher times, Mr. Azmi sensed a shift in the tide. At every street corner, young Muslim men were beseeching passers-by to back a new political force in the state: the All India Majlis-e-Ittehadul Muslimeen, known as the M.I.M. And kites, the party’s symbol, seemed to be everywhere. “Young men in Byculla were speaking in one voice,” said Mr. Azmi, who heads a group promoting Urdu language and culture. He was already disenchanted with Congress, whose local leaders paid little attention to the neighborhood or its people. By the time he got to his polling place, he said, he had changed his mind, and voted for the M.I.M. With a stridently right-wing Hindu nationalist group, the Bharatiya Janata Party, sweeping to victory after winning elections across India, the delicate balance between the country’s religious and ethnic minorities, and especially its Muslims, and the majority Hindu population is shifting. Their faith in the avowedly secular Congress party, which ruled India for decades, is dwindling, and the emergence of a strong Muslim party in Maharashtra suggests a possible consequence. The Bharatiya Janata Party, also known as B.J.P., leadership’s penchant for making provocative remarks and stoking communal tensions, combined with the trend away from Congress is leaving Indian politics more polarized on sectarian lines, as the election results in Maharashtra illustrated. The B.J.P. won overall, but M.I.M., making its first foray into the state with a field of mostly novice candidates, won two seats, including Byculla, whose population is 40 percent Muslim. Waris Pathan, a criminal defense lawyer who grew up in the neighborhood, decided to join the party and be its candidate the day before the deadline for nominations. Despite his inexperience, after just 12 days of campaigning he managed to beat the Congress incumbent, Madhu Chavan, in a close race. The party he joined has its roots in an organization begun in the 1920s to safeguard Muslim interests in Hyderabad, a princely state that had a mainly Hindu population but, in those days, a Muslim prince and ruling class. The group became a political party in 1959, and its leaders these days are known for practicing an aggressive brand of communal politics, just as some B.J.P. leaders are. Until now, the party’s influence was confined to its home state Andhra Pradesh, while Muslims in most parts of the country pegged their hopes to the Congress. Akbaruddin Owaisi, a party leader and fiery orator known for his vitriolic speeches, has been charged several times with hate speech over remarks denigrating Hindu gods and inciting violence. He was arrested last year on charges of inciting communal enmity, sedition and criminal conspiracy for speeches he made in Andhra Pradesh, where he was quoted as saying that India’s Muslims “can take care of” the country’s Hindu majority “if the police stay away for 15 minutes.” In a speech in Mumbai before the election, he accused Hindus of similar sentiments: “They want to finish off Muslims, and end secularism,” he said, according to The Indian Express. His speeches, posted on YouTube, were very popular in Byculla before the election. Voters in the neighborhood were ready for the message after complaining for years about neglect by the Congress’s political establishment. Most voters felt that no other secular party had a chance of winning, Mr. Khan said, and they did not want to waste their vote, so they turned to sectarian parties. Muslims make up about 13 percent of the national population, but won only 4 percent of the seats in the new Parliament, the smallest share since Indian independence. Analysts said that in recent times, mainstream political parties have been putting fewer minority candidates on their tickets because of concerns that they will not be able to win, producing alienation. Adnan Farooqui, an assistant professor of political science at Jamia Millia Islamia, a New Delhi university, said M.I.M.’s agenda “is reactionary at its core,” and he compared the group with right-wing Hindu parties that have practiced violent communal politics for years. “It promises to deliver, as far any physical threat to the community is concerned, much like the Shiva Sena,” Mr. Farooqui said. However, Mr. Pathan, the newly elected M.I.M. legislator, insisted that his party’s ideology was wholly secular and that its agenda was the welfare of all minorities, not just Muslims. He said his goals were to reopen shuttered schools, provide medical facilities to the needy and provide legal aid to the many young Muslim men who have been detained without trial in terrorism-related cases. “We are not against any community, but we are certainly against the ideology of certain communal parties,” Mr. Pathan said, his voice soft but strained. “If anybody voices communal sentiments against any minority, we are not going to take it lightly. We are replying. That does not make us communal — we are just defending ourselves. Published in print and online, The New York Times; November 8 2014.